Eric submitted an e-mail asking for my opinion about open cell gutter inserts. You’ve probably seen them at your local home show, home improvement store, or online. Maybe you have them installed on your home. They are black foam-like inserts that fit inside your gutter. By filling the cavity of your gutter, they prevent leaves and debris from entering the gutters, yet allow water to flow through. There are several brands on the market and they look remarkably similar to one another. I was going to avoid writing about this style of gutter guard because I believe these products have design flaws that will render them ineffective over time, and I didn’t want to comment on them before I had a chance to test them. However, I’ve recently heard from people who are considering purchasing this style of protection for their homes, from homeowners who purchased and installed them, and from roofing and gutter contractors who have installed them in the past. Thanks to Eric’s questions, it’s time to write about open cell inserts. I’m going on record to say that I have not tested these products yet, so my observations are based on my industry expertise, viewing the products, comments from dealers who have installed them, and homeowners who installed or had them installed on their homes. The manufacturers claims that the open cell gutter inserts accept most-to-all water that drains off roofs, is a true statement, I believe — at least when the product is first installed. Since they’re relatively porous and will absorb water as it flows off the roof and down the valleys, they will most certainly work. Leaf Defier, GutterFill, GutterStuff and a half-dozen look-a-likes are designed to fit in gutters like a wedge. Shaped like a right triangle (2 sides form a 90º angle, the third side is 45º), the narrow end of the wedge rests at the bottom of the gutter, and the wide end extends across the entire gutter opening, effectively sealing leaves and debris out of the gutters. 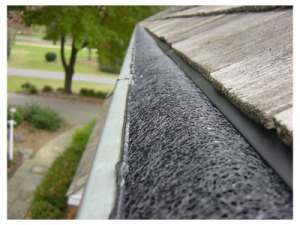 As water flows off the roof, it lands on top of the porous material and drains through the cells into the gutter. Flo-Free incorporates a different design but the same drainage principle. Flo-Free is 3/4″ thick industrial-strength nylon, according to the manufacturer. One end of the product is designed to sit against the bottom of the gutter and the other end rests the back edge of the gutter, creating an upside down J-effect. Flo-free reminds me of a reusable furnace air filter or the colorful wiry round plastic pot and dish scrubbers, while Leaf Defier and GutterFill look more like the foam padding inserts that protect computers, TVs and audio systems. The primary contention I have with the open cell gutter inserts is the product design. Most of the inserts look similar to a right triangle. Since the foam-like material is inserted inside the gutter, the area on which the water flows is flat, and it sits below the gutter lip, which will create a barrier that makes it difficult for small debris to wash off the surface. Hopefully, you see where I’m going. In order for a gutter guard to be effective at shedding debris, it needs to have an angle — essentially a downward slope from the back to the front of the gutter. With the exception of Flo-Free, these products have no slope; therefore, no ability to naturally shed the debris that is bound to land on the top surface. This is a significant problem because without a slope, it is likely that debris will not only collect, but will do so quickly. While some debris may blow or wash off the top surface, I suspect more debris than not will stick to the surface. When leaves get wet and dry, they have a tendency to bond together with other leaves and debris, which make it all the more likely that you’ll have to brush off the surface in order to dislodge the debris from the surface. While the manufacturers claim that pine needles will “roll off” the surface to the ground, I don’t buy it. Shingle granules will definitely not roll off the surface. If anything, they’ll lodge in the porous openings. Depending on the size of the cells, some granules may wash into the gutter like the manufacturers claim, but I believe that most will settle within the cells and the inserts will have to be removed from the gutters, cleaned and reinstalled on occasion. Even if these systems continue to allow water to get past the debris into the gutter, the fact that you’ll have to clean off the surface on a regular basis will likely outweigh the perceived benefits of the system. Flo-Free is arced across the gutter opening, so it looks like a dome. The good news is that the forward facing arc will help coax debris off the surface, but the rear-facing arc will cause debris to get stuck between the shingles and the peak of the arc. The only way you will avoid the rear-facing slope is if the shingles cover this area, in which case, Flo-Free may be the most effective of the open cell systems. #1 — A homeowner in Seattle called telling me that he purchased open cell gutter inserts because he has a metal roof that limits the type of gutter guards he can install on his house; it was relatively inexpensive compared to professional grade gutter guards, and he could install them himself without special tools. He said that pine needles build-up on the surface, which requires him to clean the surface, but his biggest complaint is that when the temperature drops below freezing, the water freezes within the cells and his gutters became like an ice tray. #2 — A roofing company near Knoxville was asked by a customer to install Leaf Defier once they completed a roofing job. Within 2 weeks of the work being completed, the homeowner called the contractor asking them to remove the system because he was dissatisfied with the product’s performance. And the kicker was, since he made the mistake by selecting the product in the first place, he told the company that he would pay to have the gutter inserts removed. #3 — A remodeling contractor in Chattanooga said that he installed the open cell inserts on his grandfather’s house, and his grandfather hasn’t forgiven him since! In fact, the contractor said that his grandfather used some choice words when he called his grandson telling him to remove gutter inserts from his house. 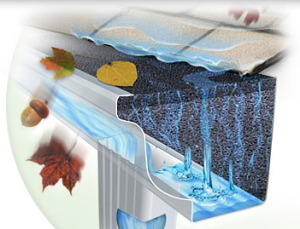 I believe that open cell gutter inserts will keep leaves and most debris out of your gutters. I believe that water will be able to enter into your gutters freely for some period of time, but I believe over time that water flow will become restricted depending on how much debris lodges on top of and inside the inserts. I also believe that these systems have inherent design flaws will make them a higher maintenance solution than what most homeowners are willing to tolerate. While the cost of these systems is less than a typical solid gutter cover or micro-screen system, the cost savings will be offset by the higher upkeep and poorer performance over the life of the product. Considering two of the three homeowners cited in the stories above requested that the products be removed from their homes shortly after they were installed, I believe that it’s safe to say that unless you live in an area with very little debris affecting the performance of your gutters, steer clear of this option. Next story Let it snow, ice and rain! Previous story What’s the Scoop on Shingle Sediment?